Carroll says he thinks the Seahawks have everything in store to take the next step in 2019 after going 10-6 and earning a Wild Card berth in 2018. 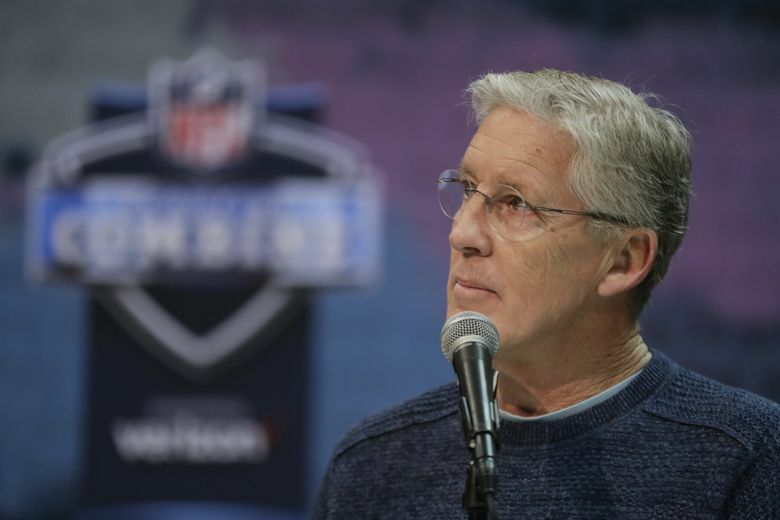 INDIANAPOLIS — As Seahawks coach Pete Carroll greeted a few members of the local media at the NFL combine Thursday, there was a brief lull while reporters scrambled to get tape recorders ready. “I can just start talking if you want,’’ Carroll said to break the silence of what was his first meeting with the media since the end of the 2018 season. It was a fitting way to begin as Carroll’s comments, both in his main session on the podium here and in a separate session with local reporters, made clear he can’t wait to get going on 2019. Sure, there are some things for the Seahawks to sort out contractually over the next few months, and the melancholy business of officially saying goodbye to Earl Thomas and maybe K.J. Wright, which could leave the prospect of only Bobby Wagner being left from the defense that won the Super Bowl in 2013. But unlike most recent years for Carroll here at the combine, sort of a traditional kicking off point to the next season, there was no real cloud hanging over the team’s head. No explaining again the pass call at the Patriots’ 1. No answering questions about disgruntled big-name players or why he fired both of his coordinators. We’ll know a year from now just how accurately last season’s 10-6 record and return to the postseason with a wild-card berth portrays the “resetting’’ of the roster that the Seahawks underwent under following the 2017 season — replicating the NFL-best plus-15 turnover margin of last year won’t be easy. But Carroll made clear Thursday he thinks the Seahawks laid a foundation in 2018 for even greater things to come in 2019. And sure, Carroll’s perpetual positivism could have spun the recent Seattle snowstorm into a Maui vacation. But if Carroll can be sunnier at some times than others, on Thursday he was so bright that it wasn’t just the future but everyone in the building that needed shades. At one point he was asked a question about the offensive line having “established’’ itself last season. Carroll, again, could hardly wait to answer. Then he followed with 252 more words on exactly why he thought the much-maligned line is now, instead, back in alignment. He’ll be even more excited if the Seahawks can re-sign veteran guards D.J. Fluker and J.R. Sweezy, each free agents, something he indicated in both sessions he hopes the team can do, without predicting yet if they will be able to do so. But Carroll reiterated the team will keep Clark one way (franchise tag) or another (long-term contract) in 2019, and expressed optimism that even if some other free agents get away, the Seahawks will find a way to make do. A year ago at the combine, the wonder was whether hiring coordinator Brian Schottenheimer and line coach Mike Solari would remake the offense the way Carroll ideally envisions it. Carroll made clear Thursday that despite whatever others may have thought of the playoff loss to Dallas, a template was set in 2018 that will continue (and it may be worth noting here again that for all the national criticism of the last game, the Seahawks averaged 26.8 points per game last season, tied for 6th in the NFL, and over the last eight games scored exactly 30 per game, third in the NFL in that span behind only the Rams and Chiefs). Carroll also felt a template was set in 2018 for the way the new core of Seahawks players dealt with the change, with new leaders and new guiding voices emerging along the way. So what do the Seahawks do to take that next step to again become contenders for long playoff runs? Well, it isn’t lost on anyone in the Seahawks organization how close they came to beating the Rams twice. Seahawks coach Pete Carroll talks about the growth of the offensive line in 2018.